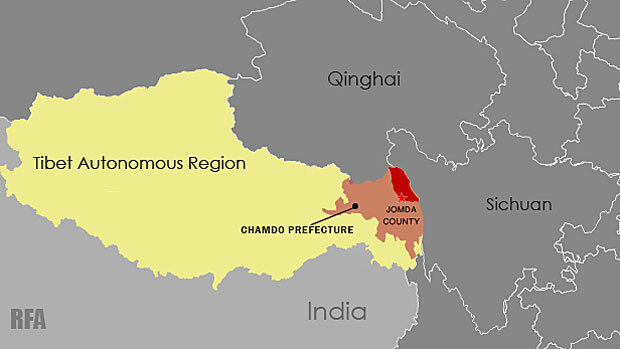 (TibetanReview.net, Jan18, 2018) – Chinese authorities in Jomda (Chinese: Jiangda) County of Chamdo Prefecture, Tibet Auto Chinese authorities in Jomda (Chinese: Jiangda) County of Chamdo Prefecture, Tibet Autonomous Region, have removed more than 10,000 Tibetan nomads from their ancestral land to widen a mining work that had been going on in the area over the last nearly 10 years. The Yulung Mountain has not only Asia’s second and the PRC’s largest copper deposit but also yields lead and gold, besides silver, aluminum, and iron as well. China discovered additional reserves in the area of Lhatog behind Yulung Mountain early last year and immediately moved to confiscate land from nomads who had inhabited the area for centuries, and fenced the area for mining work, reported the Tibetan Service of Radio Free Asia (Washington) Jan 16. The Chinese government’s move severely hit the Tibetan nomads’ livelihood not only because of the loss of their land but also on account of the ban imposed on them from collecting caterpillar fungus from the area. The caterpillar fungus, known in Tibetan as yartsa Gunbu, is in high demand especially in China for its purported unique medicinal values. They were already said to have been forced to abandon much of their traditional grazing lands over 10 years ago. The Chinese government’s action was reported to have affected anywhere from 400 to 500 families involving more than 10,000 Tibetan nomads. Local Tibetans were previously reported to have repeatedly urge the Chinese government to stop the mining operations in the area as they had polluted the environment and caused widespread illness from cast-off waste, but without any success. Now they have themselves been kicked out of their ancestral land. The report was not clear about compensation for the Tibetan nomads. It only said little money was paid to compensate for their losses.